We at MCSC are always eagerly looking for highly inquisitive and intelligent individuals to join our team. Unlike the standard modus of operandi of a corporation, paper qualifications are equivalent to a toilet roll at MCSC. To join us, first follow the instructions below. The requirements to get qualified for an interview is easy. We at MCSC have no care for your educational qualifications. You could be a graduate or a drop out. You could even have a cybercriminal record! We understand the flaws in the existing education system, we understand the flaws in the justice system, which has resulted in a world filled with educated fools. Thus, we have come up with a method to test if you are suitable for our company. 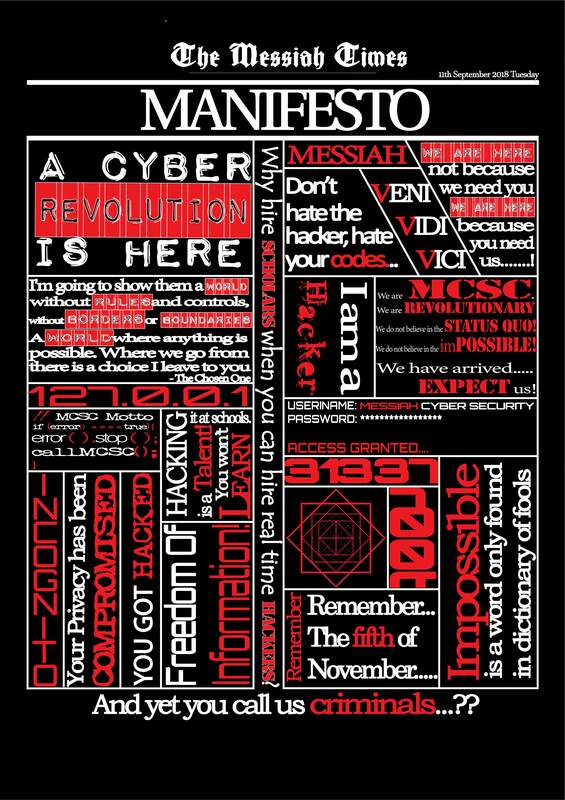 1) There is a hidden message in the Manifesto image. 2) Locate hidden message and follow through the instructions. 3) There are a total of 3 main puzzles to get past. 4) If you successfully make it through all 3 puzzles, I will be waiting on the other end for you.